Made of handcrafted genuine incolay stone. - Features pair of cherubs, devil, long stem rose and ornate swirl motif. - Clock in smoke free and pet free location. - Colors are cream white and marbled sienna. Grading: A pictures worth a 1000 words. And our pictures are better than any words we could use to describe our coins. If you ever have a problem, we want to take care of it and that is a promise. THIS ITEM IS PREOWNED. New ListingVINTAGE BLACK FOREST MUSICAL CUCKOO CLOCK WOOD LOGGING. You are buying a SUPER RARE New NFL Alumni Howard Miller Desk Clock. This wasn't an easy clock to come by. It runs ofc one AA battery. It stands about 6 5/8". The hands also gliw in the dark. Don't miss out on this one, there may never be another one listed. All items come from a Non Smoking home. Email any questions. Biyer agrees to pay $7 shippi g.
LITTLE BLUE AND WHITE SINGLE CUCKOO BIRD, MUFFLED SOUND ON CUCKOO. LOVELY BLACK FOREST CUCKOO CLOCK IN WORKING ORDER. 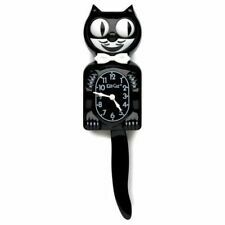 SEE MY OTHER CUCKOO CLOCK UP FOR COMPARISON. FRONT OF CLOCK STATES GERMANY. HUNTERS CLOCK, RABBIT AND BIRD ON FRONT THAT MOVE. Estate find! I wound it up and everything is working great. It will run for over a week on a full wind. The wooden base is worn and could use a refinish. Key to wind included. This is a beautiful clock. Estate find! 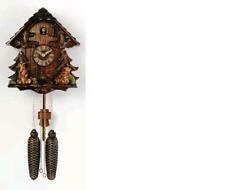 This is a nice German made chalet style cuckoo clock. 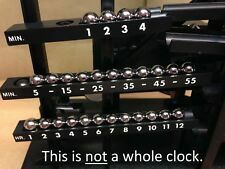 This is a musical clock that plays automatically on the hour and half hour. It features two tunes EDELWEISS & DER FROLICHE WANDERER. Has nice sounding cuckoo. Should have many more years of life left in it. The clock is very fragile and will be carefully double-boxed. Clock is all original, dial, hands etc. 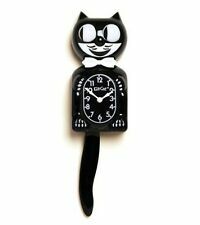 From clock collectors estate! This is a German made carved cuckoo clock. When the music plays the dancers spin around. I set it up and the tic toc and music portion are working great. The cuckoo portion is working but it is out of sequence and unpredictable. Estate find! 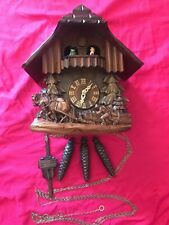 This is a nice German made carved chalet style cuckoo clock. This clock features nice carvings with amazing detail. It features the 2 tunes. EDELWEISS & DER FROLICHE WANDERER. When the music plays the waterwheel and dancers spin around. Beautiful Schatz Anniversary Clock. Heavy gold metal. Pre owned. Nice! Beautiful Schatz Anniversary Clock. Pre owned. Battery operated. All working. Heavy clock in Great fully working shape. 12" x 7.5". 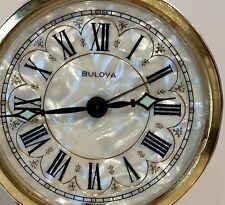 Center part swivels on top and bottom pins and has a circular pane of glass between the clock and the smaller concentric circle. 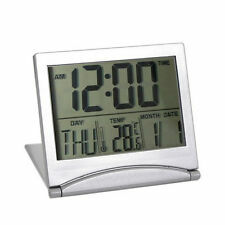 Model 229 copal flip clock. Displays 12 hour time and 7 day (Mon-Sunday). All mechanics are smooth and in good condition. Tested for 48 hours, time and day work flawlessly, alarm is in working order. No scratches or marks, looks great. Item comes in original box. Does not ship internationally, US ONLY. Shipped with USPS Priority Mail. Panasonic RC-6025 Flip Clock. Ground Hog Day! The cord has some white paint on it end it has some fading from sunlight as seen in pics! Seems fully functional except back light is not lighting up! Would be a good solid restoration piece!!! 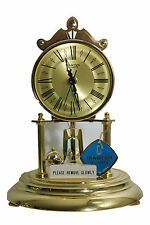 Tiffany & Co. Wind-Up Swiss Carriage Clock | Case Very Good | Clock Needs Repair. Face: Swiss Tiffany & Co. My wife was given this Tiffany Clock about 30 years ago. Bottom: 48 772 Swiss. 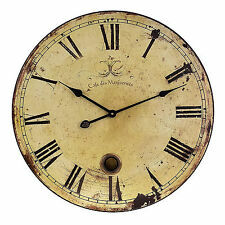 The clock needs repaired – does not work. Bulb is a circular fluorescent type. Condition: Very nice overall condition with a few issues. Printed face is in excellent shape. Light system works fine. Cord is fine. All vinyl sales are final. 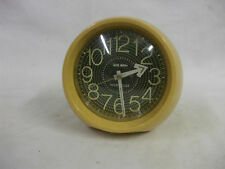 Nice heavyweight miniature clock with spinning propellor. Condition is Used. Needs new battery. Estate find! 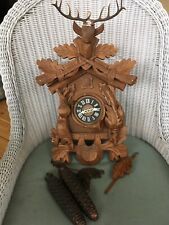 This is a nice German made carved cuckoo clock. This clock features nice carvings with amazing detail. It features the 2 tunes. EDELWEISS & DER FROLICHE WANDERER. When the music plays the dancers spin around. Shows signs of usage/wear. i try to describe the best of my knowledge. 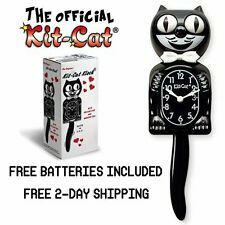 Here is a Vintage Kit Cat clock Black Jeweled Electric Wall clock. It has never been used but is missing one small eye jewel and one on the hour hand. It does work however due to never being used you have to move one of the gears to get it going at first then it’s fine, I had to do this every time i unplugged it and plugged it back in, it will not start on its own. Swiss Army Victorinox Duel Time Travel Alarm Clock with Box & Manual. Condition is Used. Shipped with USPS First Class Package. (#153) size is 16" x 9.5".